For fine mechanics, model building, mouldmaking, toy manufacture, architects, model carpenters and fitters. 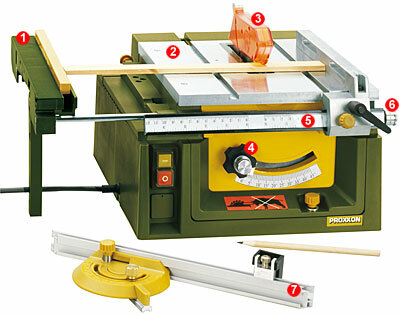 For cutting wood, non-ferrous metals, plastics, plexiglass, PC-cards, foam and many other materials. Stable construction because load bearing parts and plane-milled table are made of diecast aluminium. Table and drive can be lifted up and supported like an engine bonnet. The micro-adjustable, precise and stable length limit stop provides decisive advantages: corrections as small as 1/10 mm can be made using an adjusting screw after coarse adjustment. The sawblade, which can be pivoted by 45°, makes the cutting of double mitres possible when used with the angle stop. Low-noise drive using DC special motor with Optibelt toothed belts. Ball-bearinged sawblade shaft. Hard metal-equipped sawblade 80 x 1.5 x 10 mm (24 Z). Additional workpiece pusher and non-slotted POLYCARBONATE sawing gap cover for tight tolerances between sawblade and table. 220 - 240 V. 7,000 rpm.200watts Mitre infinitely adjustable up to 45°. Table size 300 x 300 mm. Cutting depth 1 - 22 mm: Sawblades from between 50 and 85 mm can be used (with 10 mm centre hole). Weight approx. 6 kg. Extendable table extension with integrated auxiliary stop. Plane-milled table in diecast aluminium with 2 continuous T-slots for the angle stop. Sawblade protection runs up automatically when sawing. Clamping screw for height adjustment and pivoting the hard metal-equipped sawblade. Scale helps when adjusting the length limit stop! Setting screw for fine adjustment of length limit stop by 1/10 mm. Angle stop with stop rail in aluminium and adjustable limit stop for manufacturing parts of the same length and same angle. The Table saw FET is fitted with unions for connecting to suction equipment. For dust-free working! We recommend our Compact-workshop Vacuum Cleaner link to CW-matic. Additional non-slotted sawing cap cover in ABS for tight tolerances between sawblade and table (is slotted from below by FET sawblade). For cutting very small parts. Table and drive can be lifted up and supported like an engine bonnet. For cleaning the device and easy sawblade replacement. Additional T-slot milling device (milling protection and hard metal-equipped sawblade 50 x 2 x 10 mm) for groove milling depths up to max. 8 mm available as option. Click the button below to add the Proxxon Table Saw FET 240V to your wish list.